On June 13, 20013, the collapse of an outdoor deck at a Miami area sports bar dumped dozens of people watching Game 4 of the NBA finals into Biscayne Bay, Florida. Reports are that 33 of them were injured, two of them seriously. "It was shock," said Martin Torres, 42. "People were yelling. Nobody knew. People came out all wet. They were crying. For a while, nobody knows what was going on." Many people seemed in shock, with cuts and gashes on their faces. Eric Williams, also 42, of Atlanta described the scene as "pandemonium," with people scrambling to get out. 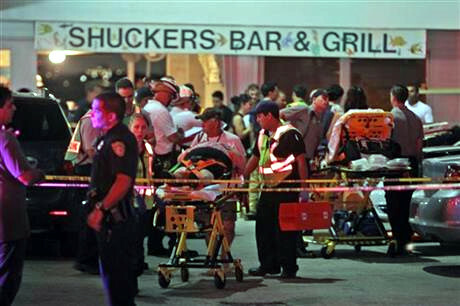 About 100 people were on the deck behind Shuckers Bar and Grill when it collapsed about 9:45 p.m., said Miami-Dade Fire Rescue spokesman Lieutenant Arnold Piedrahita. "Fortunately only 33 people were injured, 24 of those people were transported to local hospitals and only two were in serious condition," Piedrahita said. Shuckers, which has an outdoor patio deck, is attached to a hotel on a busy, four-lane causeway linking Miami and Miami Beach. 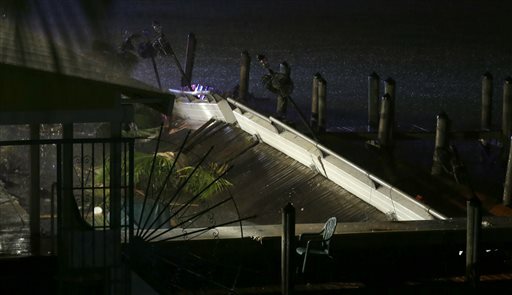 Fans had packed into the bar to cheer on the Miami Heat against NBA rivals the San Antonio Spurs, when the decking gave way just before half time and crashed into the bay, patrons told local television news. "We heard a crunch, crunch, crunch, and then we saw the pillars went down one by one," said Anthony Herrera, a witness at the bar, told local WPLG television station. "Everything went lower and lower ... it was panic," said Cesar Cabana, one of the bar patrons who ended up in the water. Source. Reports that certain celebrities were at the bar and part of the accident are unconfirmed.